Posted By:Unknown | At:8:15 AM Be the first to comment! 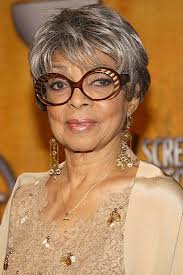 NEW YORK (AP) — Ruby Dee, an acclaimed actress and civil rights activist whose versatile career spanned stage, radio television and film, has died at age 91, according to her daughter. Nora Davis Day told The Associated Press on Thursday that her mother died at home in New Rochelle on Wednesday night of "natural causes." "We have had her for so long and we loved her so much," Day said. "She took her final bow last night at home surrounded by her children and grandchildren." Day added: "We gave her our permission to set sail. She opened her eyes, closed her eyes and away she went." Her long career brought her an Oscar nomination at age 83 for best supporting actress for her maternal role in the 2007 film "American Gangster." She also won an Emmy and was nominated for several others. Age didn't slow her down. "I think you mustn't tell your body, you mustn't tell your soul, 'I'm going to retire,'" Dee told The Associated Press in 2001. "You may be changing your life emphasis, but there's still things that you have in mind to do that now seems the right time to do. I really don't believe in retiring as long as you can breathe." "We used the arts as part of our struggle," she said in 2006. "Ossie said he knew he had to conduct himself differently with skill and thought." In 1998, the pair celebrated their 50th wedding anniversary and an even longer association in show business with the publication of a dual autobiography, "With Ossie and Ruby: In This Life Together." Davis and Dee met in 1945 when she auditioned for the Broadway play "Jeb," starring Davis (both were cast in it). In December 1948, on a day off from rehearsals from another play, Davis and Dee took a bus to New Jersey to get married. They already were so close that "it felt almost like an appointment we finally got around to keeping," Dee wrote in "In This Life Together." They shared billing in 11 stage productions and five movies during long parallel careers. Dee's fifth film, "No Way Out" with Sidney Poitier in 1950, was her husband's first. Along with film, stage and television, their richly honored careers extended to a radio show, "The Ossie Davis and Ruby Dee Story Hour," that featured a mix of black themes. Davis directed one of their joint film appearances, "Countdown at Kusini" (1976). Both were active in civil rights issues and efforts to promote the cause of blacks in the entertainment industry and elsewhere. Dee and Davis served as masters of ceremonies for the historic 1963 March on Washington and she spoke at both the funerals for Martin Luther King Jr. and Malcom X. The couple's battle in that arena was lifelong: In 1999, the couple was arrested while protesting the shooting death of Amadou Diallo, an unarmed African immigrant, by New York City police. Among her best-known films was "A Raisin in the Sun," in 1961, based on the classic play that explored racial discrimination and black frustration (she was also in the 1959 stage version). On television, she was on the soap operas such in the 1950s and '60s, a rare sight for a black actress in the 1950s and 60s. As she aged, she continued to reach new career heights. Dee was the voice of wisdom and reason as Mother Sister in Spike Lee's 1989 film, "Do the Right Thing," alongside her husband. She won an Emmy as supporting actress in a miniseries or special for 1990's "Decoration Day." She won a National Medal of the Arts in 1995 and a Lifetime Achievement Award from the Screen Actors Guild in 2000. In 2004, she and Davis received Kennedy Center Honors. In 2007, Davis and Dee's book won a Grammy for best spoken word album. "I wanted to be an actor but the chances for success did not look promising," she wrote in their joint autobiography. But in 1940 she got a part in a Harlem production of a new play, "On Strivers Row," which she later called "one giant step" to becoming a person and a performer. In 1965, she became the first black woman to play lead roles at the American Shakespeare Festival. She won an Obie Award for the title role in Athol Fugard's "Boesman and Lena" and a Drama Desk Award for her role in "Wedding Band." Most recently, Dee performed her one-woman stage show, "My One Good Nerve: A Visit With Ruby Dee," in theaters across the country. The show was a compilation of some of the short stories, humor and poetry in her book of the same title. Day said funeral services will be private but a public memorial is planned.